Quick warning, this article will be part technical, part personal story, part cultural critique. If you are just here for the code and explanation, jump to the The Initial Approach header! This story starts a few years ago in a college computer science classroom. I had an untraditional path to writing code -- I randomly enrolled in a computer science class during my sophomore year of college because I had an extra credit hour and I was curious what it was about. I thought we would learn how to use Microsoft Word and Excel -- I genuinely had no idea what code was. My high school definitely did not have any coding classes, they barely had functioning computers! I didn't play video games or engage in activities that traditionally lead to kids learning how to code either. So coding was brand new to me when I took that Python class in college. As soon as I walked into the classroom, they had us type Python code into Idle, a text editor that comes with the Python language. They had printed the code and just had us type it in and run it -- I was immediately hooked. Over the course of that class, I built a Tic Tac Toe script with a GUI to input pieces and a Flappy Bird clone. It honestly came pretty easy to me, and I had a ton of fun. I quickly decided to minor in computer science, and I just wanted to write more code. The next semester, I enrolled in a Data Structures and Algorithms course which was next in the computer science sequence. The class was taught in C++, which, unbeknown to me was supposed to be learned over the summer before the class. It quickly became obvious that the professors were trying to use the class to filter out students -- so many of the enrollees on day one made it through the semester. We even changed classrooms from a lecture hall to a break out room. My pride was the only thing keeping me in the class. I felt completely lost in pretty much every lesson. I spent many all-nighters working on projects and studying for the exams. One problem in particular really got me -- we were supposed to build a program in C++ that would solve any Sudoku problem. Again, I spent countless hours on the assignment trying to get the code working. By the time the project was due, my solution worked for some of the test cases but not all of them. I ended up getting a C+ on my assignment -- one of my worst grades in all of college. After that semester, I abandoned my idea of minoring in computer science, completely quit coding, and stuck to what I thought I was good at -- writing and politics. Of course, funny things happen in life and I obviously started coding again, but it took me a long time to feel like I was a competent programmer. All that being said, a few years later into my programming journey, I decided to retry implementing the Sudoku solving algorithm to prove it to myself that I could implement it now. The code isn't perfect, but it will solve pretty much any Sudoku puzzle. Let's walk through the algorithm and then the implementation. Because I didn't feel like writing a full test suite with different puzzles, I used the challenges on CodeWars to test myself. The first problem I tried was this -- where all of the puzzles were "easy" Sudokus that could be solved without a more complex algorithm. I decided to try and solve the Sudokus in the way I personally do -- where I would find the possible numbers for a space, keep track of them, and if there is only one possible number plug it into that spot. Since these were easier Sudokus, this approach worked fine for this Kata, and I passed. Of course, I also wanted to solve more difficult Sudoku puzzles, so I decided to also implement a more complex algorithm in order to solve those puzzles. One algorithm to solve Sudoku puzzles is the backtracking algorithm. Essentially, you keep trying numbers in empty spots until there aren't any that are possible, then you backtrack and try different numbers in the previous slots. Shoutout to Wikipedia for the awesome visualization! The first thing that I did was continue my "easy" Sudoku solver's approach of finding the possible values for each square based on which values were already in that square's row, column, and box. I stored all of these values in a list so that I could quickly refer to them while backtracking or finding which value to use in that square. Next, I needed to implement the forward moving and backtracking of putting items in each space. I put markers on each non-given space (so the ones that were zeros when the game started) so that those spaces would be included in the backtracking and given spots wouldn't be. I then iterated through those un-solved spots. I would put the first item of the possible value list in that spot and then move to the next unsolved spot. I would then put the first possible value of that spot in its place. If it conflicted with the value of the previous slot, I would then move to the second item in the list of possible values and then move to the next slot. That process would continue until there was no possible move for a given spot -- i.e. the end of the possible value list was reached and none of the values worked in that row, column, or box. Then, the backtracking algorithm kicked in. Within the backtracking implementation, the code would move back to the last spot that was filled in and move to the next possible value and then start moving forward again. If the last of the possible values was reached at that spot as well, the backtracking algorithm would keep moving backwards until there was a spot that could be incremented. Once the end of the puzzle was reached with correct values in each square, the puzzle was solved! 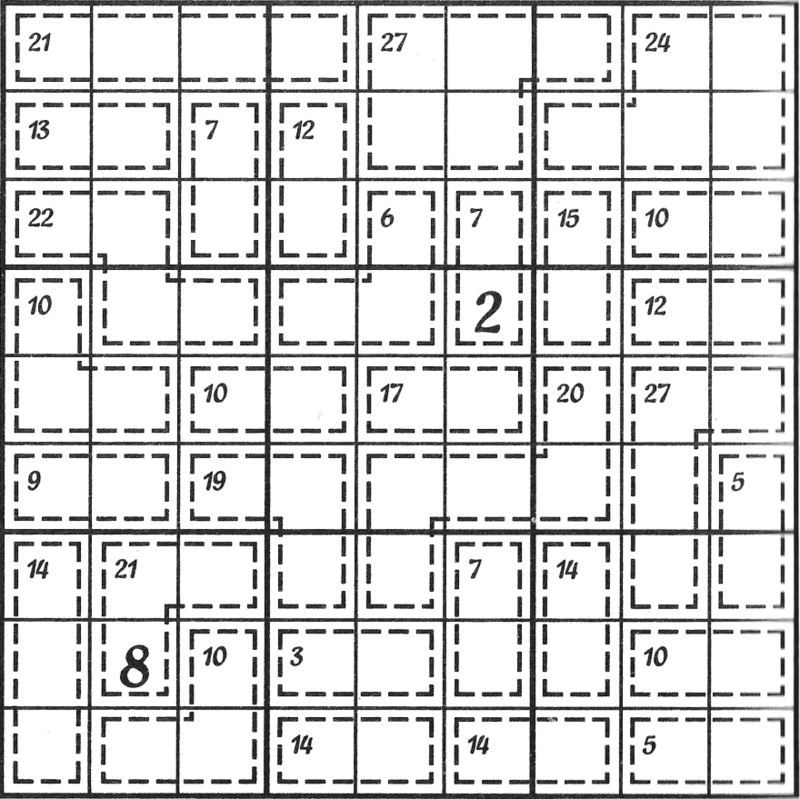 """One individual cell on the Sudoku board"""
"""Checks to see if the cell's current value is a valid sudoku move"""
"""changes the number attribute and also changes the cell's value in the larger puzzle"""
"""If the cell only has one possibility, set the cell to that value and mark it as solved"""
"""filter the possible values for the cell"""
"""checks to see if the current number is valid in its row, column, and box"""
"""move number to the next possibility while the current number is invalid and there are possibilities left"""
"""contains logic for solving a sudoku puzzle -- even very difficult ones using a backtracking algorithm"""
"""Get the full row from the puzzle based on the row index"""
"""Get the start coordinate for the small sudoku box"""
"""Get the numbers of the small sudoku box"""
"""Get the small sudoku box for an x and y coordinate"""
"""create the Cells for each item in the puzzle and get its possibilities"""
"""Move forwards to the next cell"""
"""Set the current cell to work on"""
"""set a cell back to zero"""
"""move forwards or backwards based on the validity of a cell"""
"""run the other functions necessary for solving the sudoku puzzle"""
"""runs the solver until we are at the end of the puzzle"""
Sometimes it just takes time and practice -- the Sudoku solver I spent countless college hours on took me less than an hour a few years later. I will say that computer science programs don't tend to start in a way that allows people who didn't write code earlier in life to participate, which in a few years with computer science education policy changes may be okay, but for now eliminates people who grew up in small towns, who weren't interested in coding growing up, or who went to weaker high schools. In part, this definitely contributes to the success of coding bootcamps which start with the fundamentals and teach the less conceptual web development skills rather than heavy algorithms. I can now write the Sudoku solving algorithm, but I don't think its a necessary skill for developers to have -- I still was a successful software engineer shortly after the time period that I couldn't implement the Sudoku solver. I do think that some computer science fundamentals can be very helpful, even for new developers. For example, the concepts behind Big-O notation can be really helpful for deciding between approaches. That being said, most data structures and algorithms aren't used on a day to day basis, so why are they the basis for interviews and computer science classes instead of the more important things used every day? I'm happy to see my own personal growth in coding; however, I can't wait for a day where developers aren't jumping through imaginary hoops to prove themselves and learning environments are much more constructive. From how you described the school you went to, I can say that the education system in Saudi Arabia is the same. We don't have serious computer or programming classes. In best cases they would teach you how to use MS Office and that's it. I started learning programming earlier in my last year of elementary school. It was all self-learning. I kept studying and implementing some simple code using PHP and MySQL. A few years later I lost interest and gradually moved away from programming. When I went to college I chose a major that is related to computers (MIS), and I was forced to go back to programming, specially since my graduation project was to design a whole system using Java by my own. Now I'm back again and studying so intensively. I'm happy to be programming and learning more stuff about it, but I still regret that I had stopped doing so for long years, I could've been a much better programming now. Sounds familiar to me. I went to school in Mumbai (Bombay), India where they had 'computers' as a subject since 5th grade. They used to take us to a computer tab filled with computers in late 90s, running software from 1980s and let us play Dragon Ball and Pacman on those monochrome monitors. The syllabus used to start with the chapter 'Introduction to Computers', every alternate year and if consisted of repetitive things like "constants and variables". They made us memorize a few QBASIC programs with no clear explanation and we were supposed to 'spit' it out during our practical exams. The entire environment was to make students believe that computers are boring, hard and the only good use they had was to play video-games. It took me long to realize the potential of computer programming when I picked it up during my second year of college that was supposed to be based on Electronics Engineering. I find myself lucky to even realize how fun programming can be and it all happened in class when a teacher was pretending to explain us a C program that added two numbers. Majority of my classmates flunked the subject at the end of the term, probably because of the way the subject was presented (mis-represented) to us, but I have been writing programs since that day in 2004. Adding to that, it is till today that I mostly focus on what I can make a computer do for me rather than to learn theory that makes it all sound more complicated than it is supposed to be. In retrospect every school I've been to, no matter how much they focused on programming, they always lacked the overall "if a computer can do it, why shouldn't it?" attitude, and were way too much focused on building imaginary systems instead of solving actual problems. PD: I didn't know about the backtracking algorithm, now I do know thank to you. Nice job! Always rewarding to go back and solve problems that stumped in the past. You know... now that I think about it... I'm not sure I ever succeeded at writing a Sudoku solver 🤔 Perhaps it's time to fix that for me, too! I will say that computer science programs don't tend to start in a way that allows people who didn't write code earlier in life to participate, which in a few years with computer science education policy changes may be okay, but for now eliminates people who grew up in small towns, who weren't interested in coding growing up, or who went to weaker high schools. Small town, the computer class was "Advanced Excel" (pivot tables and maybe vlookup), most of the school was on free lunch so computers at home weren't a thing... I'm still dealling with that feeling of not knowing a lick about anything anyone is saying. I ended up in a couple programming classes due to my math program, but overall, it was just playing around (nothing to show of it either) while unemployed after graduation that helped show my interviewers that I knew how to Google and learn on the job enough to hire me. Thanks for sharing Ali. I think it's unfortunate that those first CS courses are often used to weed out students. I'm glad you persevered, even if you did end up dropping the CS minor! Amazing, the sudoku part almost exactly mirrors my experience. For the UI, it used Vue, but really the renderer was mostly handwritten svg. It solved the lesser difficulties, but then I got bored. Later, I stumbled upon someone quoting the backtracking algorithm as described in wikipedia. So I implemented it in Rust, with the additional constraints. The first time I wrote it, it solved them all in negligible time. I also tried it 3x4 and 4x4 boards. 4x4 gave noticeable time, and anything above 4x4 took too long to run. Perhaps applying human-like transforms is computationally valuable at bigger board sizes to reduce the iteration space dramatically. Maybe I'll still port those, or make the rust code an API or a WASM embed to the UI. Probably not though. someday I'll implement this challenge as well! But currently I don't even know how to play it! '...less than an hour...' - wow.